Who’s ready for fall?? ME! I’m tired of the hot, humid summer we’ve had! 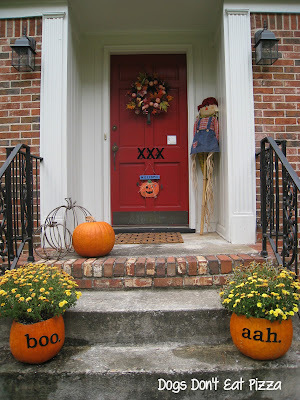 So, I thought today I’d move into fall and share a great project for adding fall curb appeal to your home. These fall pumpkin planters are an easy, quick, and inexpensive project. These pumpkin planters are super-easy to make. The whole process took me less than an hour. (1) Cut the top off the pumpkin. First, use a sharp knife (be careful!) to cut the top off the pumpkin. The size of your mum (or other plant) should determine how wide you want the opening to be, but I wouldn’t cut more than 1/3 of the pumpkin off, for stability’s sake. Don’t worry if the top edge isn’t even; it won’t really show with the plant in the pumpkin. Looks even more scary with the knife stuck in it! Boo! (2) Clean out the pumpkin. Next, scoop out the pumpkin innards (seeds and pulp). This is a great job for kids! I also cut around the sides of the pumpkin to narrow the sides (see how knife is positioned, above), so that the plant could easily fit in it. 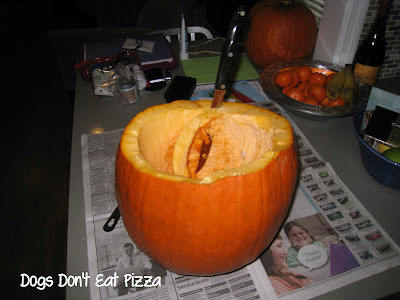 Be careful not to let your knife go through the sides or bottom of the pumpkin, though. (3) Add letters or decoration to the pumpkin. I wanted to add some letters to the pumpkin. I thought about using paint, but I had these great adhesive letters that were the right size and font, so I used those. Also, I explain below why paint might not be the best option here; adhesive, removable letters are what I used. (4) Add a plant and fill with potting mix. Please ignore the bare planting bed next to the steps…that’s another project for another day. 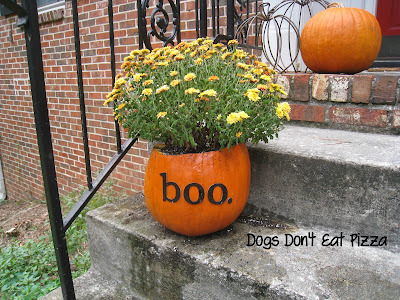 (1) If you don’t already have fall or Halloween planters, this is a festive and inexpensive alternative. The pumpkins were a little more than $4.00 each (local pumpkins at Whole Foods, 3 for $13) and I had the letters and extra potting soil already. (2) Except for the letters, it’s all compostable! After the mums have faded and fall is behind us, you don’t need to put this in the trash. Take the letters off, cut up the pumpkin, and throw it and the plant in your compost bin. If you don’t have a compost bin, you can put it with your yard trash and they will put it in their compost pile – you don’t even have to cut it up. That’s why removable letters are better here; I can remove them and then compost the entire thing. I wouldn’t want to put paint in the compost bin. (3) It was easy. As I mentioned above, the whole project took less than an hour. (4) This is the perfect project to do last-minute. The pumpkins will eventually decay, so you can’t have these out for more than a few weeks, at most. So, grab yourself some warm apple cider, get some pumpkins, and get planting! 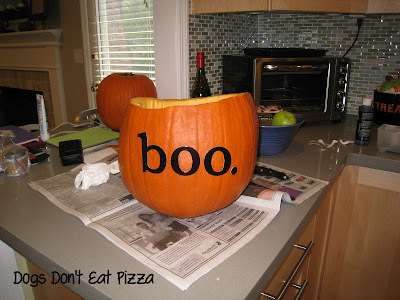 Very cute idea and will carve one out this fall! Here on the coast of Maine, I’m still enjoying summer after a long snowy winter! We’ve had a stretch of hot, humid weather here. We are fortunate to have a backyard pool so I’ve been in and out of that to keep cool while sanding 3 chair projects. Have you ever painted an upholstered chair? My daughter and I are trying something new. I sanded the wooden arms and legs of an upholstered chair I got at our local Firemen’s Auction. We then gave it a good vacuuming and lint rolling and protected the fabric so she could paint the arms and legs. We will be mixing a liquid fabric medium into latex paint and following directions she found on Pinterest. The arms and legs still need a second coat so if you or any followers have any tips …..or warnings, please let me know! Thanks! Wow – so cool, Karen! I’ve never painted a chair before – but maybe a reader has and can chime in?? Good luck! Please share the finished chair – I’d love to see it!! 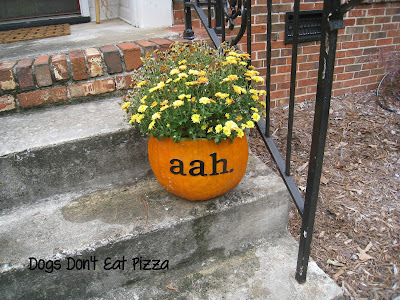 I love this, and so plan on doing this to our pumpkins.